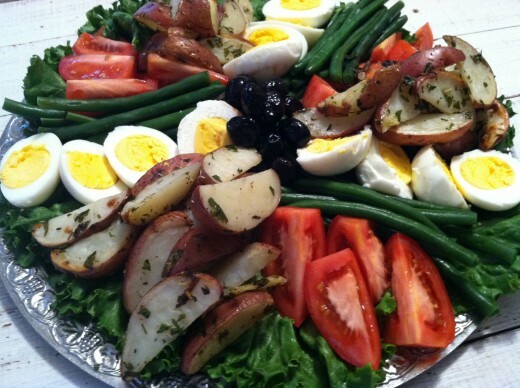 We eat a lot of Nicoise around here. So much so that when I asked my boys if they wanted anything special from the grocery store I shouldn’t have been surprised by their answer. They huddled together in the older boy’s room to confer like game show contestants. Then they lined up side by side. The younger boy must have won the vote for spokesperson. It’s at times like these that I feel like a bad American mom. Not just atypical, but bad. I know I’ve grown them well on home cooked meals, but when your kids have to ask for something so mundane as a treat, you can only stand wincing while you giggle. So I bought the white bread, found olive oil mayo on sale, buy-one-get-one-free, took my tuna to the register with other purchases, and went home. They were all excited when I told them. I pulled out the mayo and then the white bread that was all smashed and warpy from my attempt to carry in all my grocery bags at once. I forgot how fluffy the stuff is. I washed the celery and started looking through the bags for the tuna. I looked and looked. I started to get frustrated with the guy at the register because he’d already proven himself to be pretty darn inept while I was checking out. It was then that I remembered. I had given Inept Checker Man my cans of tuna saying I didn’t want them after realizing that they were all banged up. I don’t buy dented cans because the seal could be broken and the contents exposed to hazardous microbes. Now who’s inept? No tuna. Poor kids. To watch their sweet faces fall when I had to tell them. Daddy saved the day by making them grilled cheddar cheese sandwiches with white bread. The next evening I bought them two sound cans of tuna and they gobbled up their sandwiches. And they did the same at lunch the day after that. Happy boys. But we still love Tuna Nicoise. 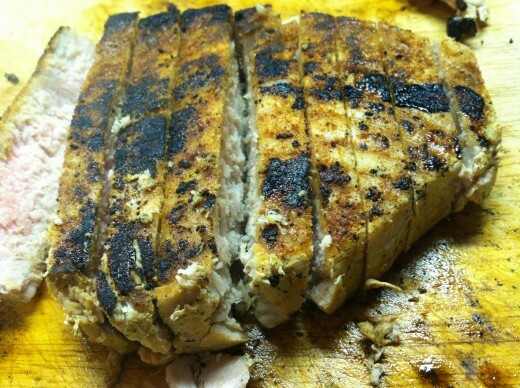 It’s like a party platter for dinner and the fresh blackened tuna tastes like beef steak! I sometimes roast the potatoes. I use small red potatoes and cut them into wedges. Then I drizzle on extra virgin olive oil, sprinkle with salt and pepper, toss in minced parsley and rosemary. I roast them at 350 degrees until they are tender, about 30 minutes, tossing them every once in a while as they cook. 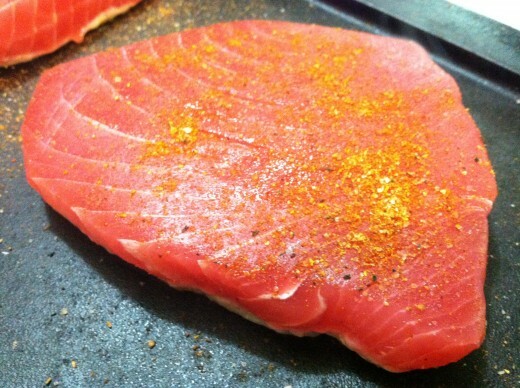 I blacken the tuna steaks using a blackening rub. A cast iron pan over high heat makes quick work of them. When I’m not serving them to children, I leave the center rare. It’s the only raw fish you’ll get me to eat. 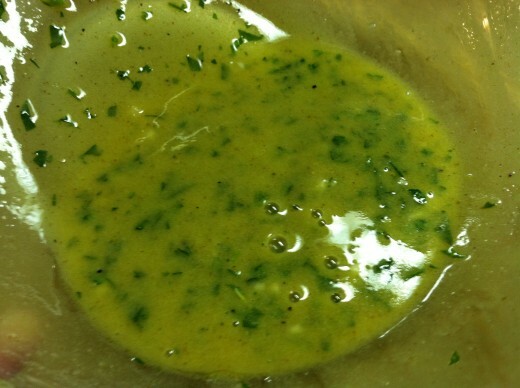 My favorite vinaigrette for this dish is mustard based. The last time I made Tuna Nicoise I chose raw apple cider vinegar as my acid. 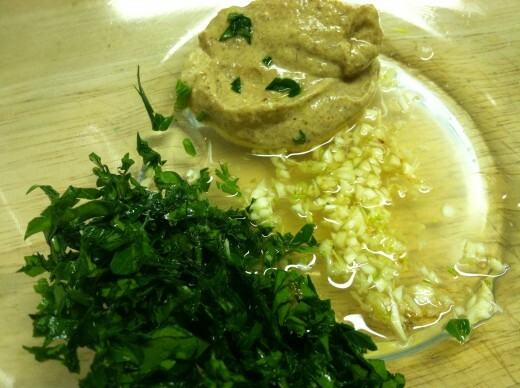 Mix together the garlic, mustard, parsley, vinegar, and water. Rapidly whisk in the oil to emulsify. Season with salt and pepper. THIS IS THE BEST meal!!! WE loved it! Can’t wait to have it again!!! I’m glad. We can definitely do it again. I don’t have a pic. of the tuna ON the Nicoise. I should have asked you to take one. All of my other pics. of this dish are on my broken laptop.